It's all about natural beauty, native Americans, locks, canyons and glorious American history as the American Empress cruises along the Snake River, meeting the Clearwater River on its way to the Columbia River and ultimately the Pacific Ocean camp where Lewis and Clark accomplished their mission for Thomas Jefferson. And simply seeing the names of the two towns on opposite sides of the river, and in different states as well, lets you know how important Jefferson's explorers heading to the Pacific Ocean are to the area. Lewiston is in Idaho and the county seat of Nez Perce County, named for the native Americans who settled, fished, hunted and freely roamed the area. Clarkson is the city's smaller twin in the state of Washington, the river being the dividing line. It's here the Snake River makes a left, goes through some locks, and empties into the Columbia River. Because of the locks, Lewiston, despite being some 500 miles from the Pacific, holds the title of being the farthest inland port on the West Coast, and is Idaho's only seaport. It's also the city with the lowest point above sea level, despite the massive and gorgeous mountains that abound. It's just a few miles past Lewiston that the Snake goes through Hells Canyon, a 10-mile wide canyon that borders not only these two states but Oregon as well. This is the deepest gorge in North America, close to 8,000 feet carved out of the basalt rock mountains by the Snake River water. And this is where the locks begin. The Empress goes through four locks on the Snake River, all maintained by the US Army Corps of Engineers, all about 100 feet high, and all built with ladders to allow fish to swim upstream for spawning. It's a fascinating experience going through the locks, watching the Captain leave his wheel house to take up a second wheel outside and adjacent to the side of the ship hugging closest to the snug fitting lock. But there's the awe of the Nez Perce reservation to enjoy first. With their hop Hop-On-Hop Off busses that travel on land as we cruise, ready to meet guests for rides to historic and spectacular sites, the Nez Perce Historical Park is far and away the most spectacular spot in the area. Here it's easy to learn more of the history of the culture and lives of the Native Americans, both through a well-done video by the National Park Service, as well as artifacts, jewelry, hand-crafted artistry, together with knowledgeable guides and volunteers eager to share this history. A stop at an early 20th century Tudoresque-type home, Bridablik, was mildly interesting, and the stop at a Walmart, and the enthusiasm of some travelers eager to visit it, reminded me the western part of the nation is a lot different from our busy Eastern half! It's the biggest shopping area for 150 miles around! Traversing the locks is fascinating to a non-engineering mind that can only marvel but not understand how a big boat can be maneuvered into a very narrow space just long enough to hold it, and huge metal doors seal it in at either end for the 10-15 minute falling or rising of the water that enables the journey to continue on the other side of the dams. It's also here you can see the ladders built along side the dams, making it possible for salmon and others to follow their natural paths and continue their nature course. This is also the area where we began seeing some of the wildlife that abounds in both desert and mountain settings, along the river and high in the air. Eagle and turkey vulture hang out in tall trees along the river's edge, cliff swallows seem to follow along the side of the boat, and while they say mule deer graze in the area, it seemed that cattle grazing on rocky and uneven ground were the most prolific mammals around. The land is barren here, compared to the lushness of other areas along the Snake and Columbia rivers, but it is soothing, restful, unforgettable, and not to be missed. 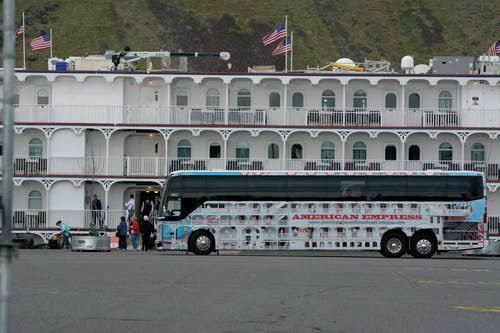 As enticing as the excursions to various museums and points of interest are while on an American Queen river cruise on the Columbia and Snake rivers, there's so much to do, see and talk about even if you opt to stay aboard and not take advantage of all the extras included in the cost of the trip. There's no doubt it, river cruising is expensive, whether it is in the United States or Europe, probably a bit higher here because of higher port fees and salaries. But once you pay that initial whopping amount, you really don't have to spend another cent. Even for tips. There's a $17.50 charge per person per day put on your credit card payable at the end of the trip, and it's only if someone has done something extraordinary, gone out of their way, or you simply want to, that you would go over and above that amount. It's shared by everyone from the entertainers and cruise director right on down to the room cabin and dining room wait staff. In addition to every room having an outside view, most with doors leading out to private balconies, all meals, snacks, non-alcoholic beverages and wine at dinner are included in the original price. On the American Empress, there was a great soft ice cream machine with three flavors in the Paddlewheel lounge on the top deck along with soda and juice machines with four or five flavors or varieties. And there are always cookies or pieces of fruit. It's hard to go hungry! The meals themselves are plentiful and offered in more than one venue. Breakfast is served in the formal dining room and you can help yourself to pastries and fruit and then be served all manner of cooked, baked, or fried breakfast entrees. Or you can opt for that Paddlewheel Lounge and help yourself buffet style to both hot and cold selections. Lunches can be as sparse or palatial as you'd like, and dinners are varied, attractively presented and prepared by chefs who take advantage of local fresh fruits, vegetables, seafood and meats, all of which are outstanding. Having salmon in the Washington, Idaho, Oregon area is worth the price of the trip alone! There are no 'assigned' seats and you might invite yourself to sit at a table with three or four others or choose a table by yourself to finish that last chapter in the great book you brought along. And never fear, if you're about to pass through a lock, or there's an eagle or mule deer just off the port side, or a congress of crows are flying over, the ever-alert Riverlorian Laurence will be on the PA system to point you in the right direction. It's some of these impromptu and unplanned sights that turn out to be the most memorable and exciting. Every evening there's a different form of entertainment, and here again, the Empress folks take advantage of local talent. Probably one of the most unique on this cruise was while we were on the Nez Perce reservation and a local resident, in full regalia, came aboard to delight and charm an audience with humor, stories, and a little bit of home. Other nights there are varieties of musical style, one night it might be a sock hop with a quartet leading the way, a rock and roll party, or an evening of sheer entertainment rivalling Broadway. There were two memorable nights of unbelievable talent. . . one with Greg Pendzick who can belt out spectacular Broadway hits complete with accompanying dancing and costume changes, and Lindsey Pendzick, possessor of a voice you can never forget. Greg and Lindsey are married and both work for the cruise company, having turned down several offers to bring their talent to stages in Manhattan and the west, but instead opting for the cruise line because of the time it gives them to each practice their art and talent and still have time together. Lindsey is also the hotel manager and is as tireless as she is both accommodating, ever-pleasant and always charming. For those wanting to keep the party rolling, there's late night music, drinks, jokes and conversation in the top lounge, and Frank's a great pianist who keeps it all together. Even if you opt to stay aboard every day instead of taking any excursions, there are activities to draw your interest, from crafts and games to quizzes, trivia contests, and tours of the wheel house and engine room. There's also all those magnificent paintings, precious papers, and photographs that line the walls and are explained and identified so well in the Art Gallery book in your stateroom. So, what does it all cost? Depends on the trip, when you book it, and what you need. Of course, rooms for singles may add a premium, but the room is still plenty big enough for two. A recent trip, eight days, seven nights, including that first night in the spectacular Davenport Hotel in Spokane, generally goes for around $7000 a person. But there was a special going on, offering the trip to just under $3,000. . . even for a single reservation. . . ..to folks who have never tried the American Queen Line. Hardly a gamble, and too good an offer to turn down, even with airfare from New Jersey to Spokane added. Admittedly, I was a bit dubious as to whether every luxury would be included, but indeed it was, plus so much more! When I noted the trip was featuring the route Lewis and Clark took when commissioned to find a route to the Pacific by Thomas Jefferson and we would be celebrating the President's 275th birthday while on the trip. . . .rest assured, there was a special Black Forest cake complete with fresh pansies on top served to me and my table guests, as well as a rousing Happy Birthday led by the crew with everyone in the dining room joining in. Mr. Jefferson would have been humbled, but pleased. The day the American Empress tourists spent visiting Richland, Washington and the surrounding area was almost too full of information with too much diversity to be able to take it all in, let alone remember it. Cruising on the America Queen sternwheeler following the trail of Lewis and Clark had been educational, exciting, and relaxing to this point, but delving into the 20th century and the area's involvement in the Manhattan Project and how the little town of Hanford grew in population from 300 residents to more than 25,000 added an entirely new dimension to an incredible experience. We missed out on visiting the museum at the Washington State Park set aside for Sacajawea, the Shoshoni Indian woman who accompanied Lewis & Clark in their journey to the Pacific; that was because the state either forgot to turn the power on for the season or there was breakdown in the electrical system of some type. What was evident was the breakdown in communication between the state and the cruise company since the on/off busses continued to stop at the park and volunteers continued to tell the drivers there was no admittance to the museum. But there was so much to learn in so many other areas. The Hanford Reach, for instance. A reach is a stretch of uninterrupted level river, the beginning and ending of which are chosen for geographic, historical or other reasons, like landmarks, topography or gauging stations. The Hanford Reach is a national monument which is unique, since there is no monument, simply a 51-mile long stretch of the Columbia River between Priest Rapids Dam and Richland. It's an area that's never been dammed or dredged, so there are lots of bars, ponds, and sloughs that form the natural, undisturbed habitats for salmon, sturgeon and steelheads, among other fish. The Museum there is a spectacular conglomeration of stories, exhibits, and culture of both the environmental importance of the area and the impact building the Atomic Bomb had and continues to have on the desert and rivers in the area. There's an entire gallery at the Museum devoted to the Manhattan Project. It tells a rather sad story about the people who lived there and explains why and how the activities that took place there and displaced all the residents resulted in an American victory and the end of World War II. Hanford was a tiny town where the people who settled in the beginning of the 20th century made their living farming and built up their community. They had their own railroad link to the transcontinental railroad, a hotel, a bank, and its own schools for both elementary and high school students. But in 1943, in the midst of World War II, the town was condemned by the federal government; residents weren't told the reason why, but they were given 30-days to vacate their homes and all the property they owned; most of the buildings were destroyed behind them. The high school remained, and it was used as the construction management office for what became known as the Hanford Site. The school is still there, although a bit beat up by the experiments and trials that took place there. Once the Army, who owned the more than 600 square miles of land along the Columbia River, destroyed all the homes, they had contractors build the "alphabet houses," a variety of styles of homes built for the workers and their families brought to the area to work at the Hanford Site. From the 300 farming families who lived there prior to the war, the town exploded into 25,000 residents in the two years from 1943 until the dropping of the atomic bombs on Nagasaki and Hiroshima, bombs made, at least in part, at the Hanford site. Riding through Richland, it's easy to spot the prefabricated duplexes and single-family homes that still stand as their own testimony to the families who were moved in to produce the material to build those nuclear weapons. The Project and Army influence were disbanded in 1947 and today many of the area's properties are on the National Register of Historic Places. For those fascinating by the role of nuclear weapons in defense of the country and the uranium necessary to build them, the cruise ship also offered a premium excursion for an extra fee to get a close look at the B Reactor. I opted out. Much more fun was getting back to the riverboat and hearing Riverlorian Laurence Cotton tell some great stories about the Oregon Trail and answer just about any question you could have about anything along this fascinating trip, the people who made it so historic, or the wildlife you might encounter.